Not to be stuck on too many still-in-print books, but this one came to mind today and I just had to write it up. Not to be mistaken with the uber-famous Arthur the Aardvark, this little guy is a precocious, but mellow rascal and one I remember quite fondly from my school library-going days. First, I will tell you what Arthur is like most of the time. Most of the time, Arthur is a kind, helpful, understanding, well-behaved, sensible, orderly, responsible, loving, lovable, altogether wonderful son. BUT... sometimes, Arthur is a problem; not all of the time, mind you, just sometimes. Cut up into a few short chapters, my favorite scene was always when the mother offers Arthur red ants and he refuses to eat them. After begging and pleading and frowning, when his mother finally asks him what he will eat, he says just simply "brown ants" and sticks out his long, long tongue at her. Classic. 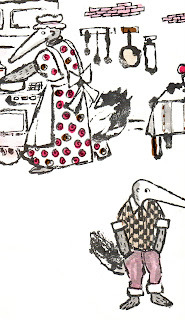 Mr. Waber is most famous for his Lyle the Crocodile series, but Arthur is so much like every disaffected but curious child I know that it just kills me. When I was little I remember being intrigued by his room (particularly the necktie hanging from his light fixture) and wondering if that was really what little boy's rooms looked like. Guess now I know.